Mixing shampoo and conditioner may seem like a great way to save time, but the chemical make-ups of the two are not made for combination. Bottles that come pre-mixed are your best bet for successful cleansing and moisturizing. Two-in-one technology first hit the stores in the 1980s; now over 20 percent of shampoo sold has this technology. Knowing what your hair type needs is key to ensuring proper cleaning and conditioning levels. Determine your hair type. Depending on your budget, there are dozens of shampoos and conditioners on the market geared toward specific beauty needs. Many hair product companies offer free questionnaires on their websites that will teach you about your hair category. Wash hair first with shampoo alone. The cleaning jobs carried out by a class of chemicals called surfactants, according to rsc.org. The lather created by surfactants creates tension between hair and scalp lifting away dirt and oil allowing it to be washed away instead of being redeposited on hair. Apply conditioner to hair only after rinsing shampoo. Shampoo opens the hair cuticle to lift away dirt and oil --conditioning agents close and smooth the cuticle replacing essential oils that shampoo strips away. Use two-in-one shampoo and conditioners when you want to save time and money and to give your hair added moisture. 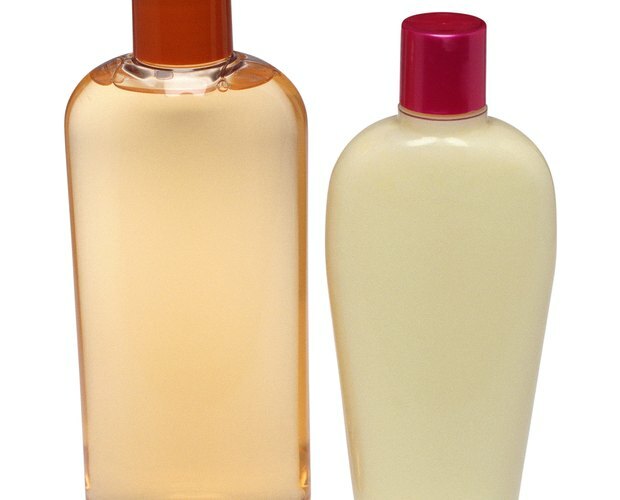 These products add two ingredients to regular shampoo, silicone and a suspending agent, according to thebeautybrains.com. Dimethicone is usually the silicone, or conditioning agent. Glycol distearate is what keeps the the cleaning and moisturizing ingredients from combining in the bottle. Water activates the shampoo and separates the silicone out where it stays on hair to provide conditioning, according to thebeautybrains.com. Read bottles carefully. If your hair is fine, too much conditioning will cause it to be limp and lifeless. Hair that is damaged and dry needs extra conditioning properties. Never use hot water when washing hair as it will cause over-drying. Rinse hair with cool water to smooth cuticles and add extra shine. Exercise caution when washing hair. Do not ingest it or get it in your eyes. Rita Boland holds a Bachelor of Arts in journalism. She has worked in television news and served as a contributor for various online publications. Does Sulfur 8 Promote Hair Growth?